Hopes: I hope the city of Duluth can rebound from its economic malaise; I hope the state can rebound from its economic malaise; I hope the country can rebound from its economic malaise; I hope the world can rebound from its economic malaise; I hope Mars can rebound from its economic malaise, and I hope I get over this darn head cold. Predictions: The city will not rebound from its economic malaise; the state will not rebound from its economic malaise; the country will not rebound from its economic malaise; the world will not rebound from its economic malaise; Mars, ditto, and the head cold will go on and on. I'm a writer, not a performer, OK? Some who write are so at ease speaking in front of folks. Not me. I guess I'm basically shy. My wife says I'm a shy Swede. Our family all did the Myers Briggs tests and I am, of course, an "I" (Introvert). Two in my family members are "E's" (Extrovert) and two of us are "I's"
I'm bearing my soul to you today to tell a little known fact about how shy I am. It's hard for me to "be on" and in the spotlight. I like the kind of spotlight where I can hide behind my writing…sort of in the dark. I've turned down offers to speak before groups or appear regularly on TV because–I just can't do it. This book I have out forces me to be in the spotlight a bit, if I am to do what is expected to sell books. There have been newspaper interviews, of course. But I have had to take a big gulp and be in the spotlight as a guest on a couple of radio and TV programs in order to get the word out about the book. Today I was on the "Help Me Rhonda" show on KDAL radio–610 AM– from 1-2 PM. Honestly, Rhonda Grussendorf did help me–so the name of her program has credibility with me. She is a pro and made me feel so comfortable that I actually enjoyed the interview, despite the fact that I was in the spotlight and on the air. Hope you were listening today. It was fun and she relaxed me enough to get me to tell about some interesting tales of my work at the DNT and a bit of background about the book. You did "Help me, Rhonda!" And so have the other radio and TV personalities who interviewed me. They are all pros and I don't know how they do it! But that doesn't mean that I've changed my ways. Half of my family understands and the other half knows what it is like. Is there any one else out there who understands? 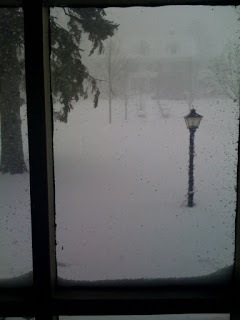 It's a white out and a cozy day to stay inside. Hope you're enjoying your time with family, watching the big game, or just hunkering down with a good book. Hmmm....what new books might be out this season that would make good winter reading? (It's shameless, I know, but there are a lot of books to sell!) Anyway as those of you in our Duluth area might guess, most everything has been canceled, including skiing at Spirit Mountain and my book signing this afternoon at The bookstore At Fitgers. Our son was out snowshoeing by his home earlier and told us it was not fit for man nor beast to be out and recommends we all stay inside. He took a picture from his front window (below) to prove white out conditions. You cannot see the street or house across the street. Our front door was blocked by a big snow drift this morning and we can't see the homes down from our hillside perch either. So…if you have a good book to read (hint, hint) this is the time. Enjoy our first big winter storm! Thanks to all who came to visit and check out my book on Saturday during my Iron Range tour of bookstores. What a warm and inviting experience it was to meet so many wonderful readers and enjoy the hospitality of gracious Iron Range/Grand Rapids booksellers. Tony Dierckins, my publisher and author of Crossing the Canal, joined me for this tour. If you have not seen Tony's book, be sure to check it out. The "bridge book" is the definitive book about the aerial lift bridge and filled with history, folk lore and gorgeous pictures. Just a great book! One of our visitors was Iron Range columnist and author, Aaron Brown. Aaron is a most talented young writer. I've been enjoying reading his new book, Overburden, and would highly recommend it. Aaron and I have some things in common besides our column writing. He is the father of three young boys–two are twins–and I am the grandfather of twin boys. It's lots of work but so much fun–and we all know "it takes a village" to raise twins. Thanks for stopping by, Aaron! Thanks everyone for dropping by Barnes and Noble on Saturday. It was fun to visit with you...and nice to see the book is selling! * Iron Range and Grand Rapids book sellers on Dec. 13. Hey–glad to have received a good chuckle from my fellow blogger, Mel Magree, on his Irregular Blog site upon reading my latest satire (below). Be sure to check out his blog as I guarantee you his writings are always erudite and interesting. I had a strange dream the other night. It involved the second coming – at least the second coming as far as my religious traditions are concerned. I wouldn’t want to offend anybody for whom it would be the first coming, or no coming at all, but the second coming is a pretty big deal for people who have been brought up in the Christian tradition. Anyway, in my strange dream, Jesus shows up in our midst looking pretty much the way he always has – beige robe, shoulder-length hair parted in the middle, small beard. The savior wasted no time in getting right down to the business of saving the world, which is his job. But, like the last time he was on Earth, he needed a little help from, well, call them what you will, a group of disciples or, in more modern terminology, a cabinet. This isn’t the year 30 A.D., you know. Disciples is so First Century. Same with apostles. Good thing, though, that the original disciples, 11 of whom went on to become saints, were still around heaven, ready at the beck and call of their master, when needed. So the master got right down to work, making a series of announcements concerning whom he would enlist as his “first team” to help him with his mission. Wasting no time, he immediately announced that Matthew, Mark, Luke and John would return, serving on his cabinet. The announcement elicited great excitement at first, but it wasn’t long before some of the TV preachers and others, together with leaders of the great Christian religions, began to grouse and complain. Many said they expected great change from the second coming and wondered in interviews with the New York Times why the savior was bringing back old names from his first, well, for lack of a better term, administration. “Peter? Sure, he’s got his own basilica in Rome now, but he didn’t exactly cover himself with glory last time with his denials,” one eminent clergyman told the Times. The clergyman was granted anonymity because he is quite aged and does not want to jeopardize his own admittance into heaven when his time comes. The biblical quartet of Matthew, Mark, Luke and John, while acknowledged to be saintly and able writers and evangelists, are “warmed-over saints,” said the bishop of St. Petersburg. “We need fresh faces, fresh ideas around the returned leader if we are going to get the change he promises,” the bishop went on. Concerns were expressed also that Paul, while not a member of the original 12, (Judas? Forget about him – won’t be back) might be attacked by terrorists if he tried to journey down the road to Damascus. Still, as each day passed, the master named more of the old guard to his inner circle – including Andrew, Philip, Bartholomew, James and James (the lesser but still in the fold) – and his followers on Earth grew increasingly frustrated with his choices. Billy Graham withheld comment. I wanted to hear more, but I woke up. Crazy dream, huh? You wonder where these things come from. Groups representing animal rights and the disabled announced yesterday they are launching an all-out effort to end the U.S. government’s insensitive maligning of handicapped American ducks. The two groups, backed by the duck advocacy organization Ducks Uninhibited, are petitioning Congress and the executive branch to cease and desist in the use of “lame duck” in describing the remainder of the George W. Bush presidency and the final session of the current Congress. “We’ve had a bellyful of lame duck this and lame duck that ever since the presidential election,” said Millard M. Merganser, executive vice president of the animal rights group Friends of our Fine Feathered Friends (FFFF). “It’s one thing to shoot ducks, but must we insult them, too? Merganser was joined at a press conference by Rance G. Fowler of Ducks Uninhibited and S. Francis Drake, representing the Center for the Study of Political Incorrectness and Social Injustice at Tufts University, who said the term “lame” is no longer proper, except when describing poorly wrought theatrical performances or un-amusing jokes. “When the chickens come home to roost, we must eschew lame ducks or our goose will be cooked,” asserted Merganser. Getting their ducks in a row, the groups also announced the appointment of Huey, Louie and Dewey Duck as poster children for the campaign to stamp out lame ducks. They are the nephews of Donald and Daisy Duck of Los Angeles, who reared them. Their cousin, Daffy, is not involved in the effort because he really is lame, and Donald Duck’s wealthy but aged uncle, Scrooge McDuck, while ducking the media, has refused to endorse the effort. Nearly 200 attended the book launch event on Friday evening, November 14 at CSS. It was a festive evening with ample opportunity for socializing, book signing and a fun program. Tom Wilkowski put to tune all verses of my poem, "Cooler Near the Lake," (hence the title of my book) and I talked about my writing and read a couple of picks from my book: "Call of the Child" and The Game of Hockey is a Lot Like Life–Stupid." Tony Dierckins, author of Crossing the Canal–and my publisher, presented visuals along with a fascinating history about the canal and bridge, including interesting folk lore. It was wonderful that so many of you could come and help me celebrate the launching of my book on a busy Friday evening. I was kept pretty occupied signing books and give my apologies to those of you who missed visiting with me. Thank you to all who came and helped to make this book launch a success. Thanks too to Tony and his professional crew who orchestrated it all. The book is officially launched and the holiday book signing season begins. Hope to see you at your favorite bookstore in the weeks coming up! Catch these pictures below of this fine event. 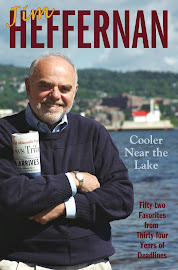 Book Update... My book, Cooler Near the Lake, is now on the shelves of area bookstores. On line book orders are also ready to process on the publisher's web site: www.x-communication.org. Just like she did as a mayor-ah. Asking for help from above. Of a bulldog, speaking precisely. When Minnesota Public Radio contacted Sen. Amy Klobuchar this week to ask which way she’d vote on the bailout bill, she said she’d vote “yes,” but implied great reluctance. Seldom do we hear politicians invoke vulgar phrases in public, much less for broadcast. I’m so accustomed to writing for a “family newspaper” (most newspapers consider themselves family newspapers, like restaurants that don’t allow dancing are family eateries) I feel I must write around or insert rhyming words or euphemisms for harmless vulgarities even here on the Internet. A brief history of the phrase she used: As a youngster, I thought we made it up -- we being my peer group at the time. When I got into the wider world, I realized that the term, meaning “very angry”, was universal in English. I’m not sure what they say in France -- don’t know much about the French I took. But the words were filed in our young brains along with other, mostly scatological, terms like bull (what the farmer hauled another load of) and son of a (rhymes with ditch), harmless enough but not qualified for use around adults without risking the threat of soap in the mouth. Who’d have thought a United States senator would someday utter this vulgar term for “very angry” on the radio, for heaven’s sake. Well, maybe not heaven’s sake, but it least it doesn’t take anybody’s name in vain. There are also sexism implications here. In my experience, going way, way back, women were not expected to “swear” as much as men, and I think that still is the case to some extent, although it’s fading fast in the 21st century. When I was a child, my family knew a widow woman who smoked and “swore like a trooper,” and she was a subject of great dinner table controversy. She was the only woman anybody knew who could swear and smoke at the same time. Moving on once again to the 21st century, on the same day that Sen. Klobuchar so frankly described her anger at the need to bail out Wall Street in alley-above-Main Street language, the New York Times reported on a similar somewhat vulgar utterance from the lip-glossed mouth of Gov. Sarah Palin of Alaska, the Republican choice for vice president. Oh, I know some might say, “yeah, that’s the liberal New York Times again,” but the quote was pretty well authenticated after the reporter viewed a video recording of a Palin debate when she was running for governor of Alaska against two men (a Democrat and an Independent). An avowedly religious candidate, Palin must have been referring to the Biblical great cojones of fire, don’t you think? Of course, I don’t know much about the Spanish I took either. The book, a collection of my favorite Duluth News Tribune and Duluth Herald columns, is coming together. If all goes well, this book will be out in November in time for the Holidays. A local publishing house, X-Communication, will publish the book, Cooler Near the Lake. 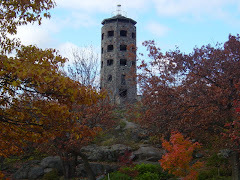 The column, Cooler Near the Lake, originally ran on June 3, 1979. It's been re-printed and copies sent across the nation to friends and relatives originally from our area, according to readers of the column who continue to ask me for copies. Of course, all of us living near Lake Superior tune in to the weather forecasters' "cooler near the lake" disclaimer when they give our local forecast. It seemed appropriate for the book title as most of my writing centers on slices of life here in the Northland. 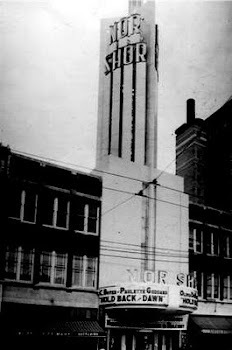 I am going through years of columns to pare down those columns to be used in the book. If you have a favorite column, you can post here or e-mail me to cast your vote. It's a daunting job and your help would be appreciated! 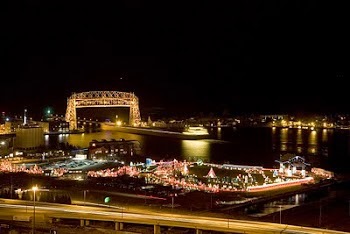 In the meantime, keep a lookout for my new column to appear monthly in the classy new Duluth Superior Magazine (www.duluthsuperiormagazine.com). My first DSM column will appear in the September edition.